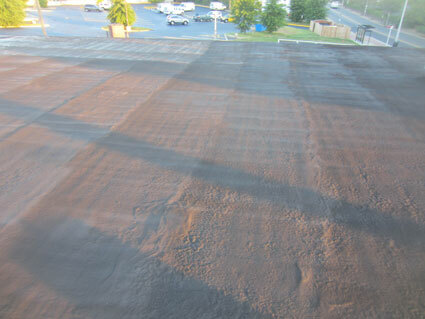 When this gravel surfaced 20-year old built up roof system failed, the TRITOflex seamless rubber membrane system proved to be the most affordable and non-disruptive retrofit option for the client. The old built-up asphalt roof with heavy gravel aggregate on the surface finally wore out and began to experience small leaks and show signs of vulnerability to more substantial leak issues in the future . This type of system with a gravel surfacing proved difficult to locate the leak sources and make permanent repairs so the client needed to either replace it or recover it with a new roof system. The client also could not afford any disruption to its daily operations in the way of roofing fumes or construction noise. This made tear-off and replacement a less than desirable solution. Most single-ply membrane systems such as PVC, EPDM, or TPO are not an appropriate option for a recovering a roof with an uneven surface left by embedded gravel. Cover boards or insulation boards would have to be installed over the gravel to separate the new membrane from the old and literally thousands of holes and fasteners would be put through the roof to secure the retrofit system. If the membrane were ever to leak from a seam failure or puncture, water would be trapped between the systems and possibly run profusely through the thousands of holes penetrating the roof. The consultant recommended a fluid applied option that would entail installing a liquid rubber membrane directly over the left in place embedded gravel after first removing all loose gravel from the roof. The best liquid membrane for this application was one that could be installed in one monolithic layer directly over the lumpy gravel without self-leveling below the gravel height. This required an instant setting rubber that can be built-up to any thickness in one coat without experiencing shrinkage cracks like most other liquids do when installed too think in one coat. The system chosen to accomplish this was the TRITOflex liquid rubber membrane. TRITOflex is an environmentally friendly water-based product that has 1900% elongation and extreme resistance to puncture. Therefore, it does not crack, split, or break open when applied directly over an uneven surface like gravel. TRITOflex requires no fabric reinforcement or underlayment and it is fully adhered right over the existing roof with no fasteners required. The consultant also recommended the white reflective TRITOcryl top coat to provide superior energy efficiency to what the roof once had. The entire project was completed quickly within five days and the client achieved a watertight and energy efficient roof system with a 15-year warranty. The client had no disruption to their regular business operations and barely realized the crew was there during construction. TRITOflex is in a class of its own with the ability to become a truly monolithic waterproof membrane in one coat, no fabric, and adhere fully to a gravel surface without shrinkage cracks or splits. Again, the TRITOflex system sets a new standard in fluid-applied roofing retrofit where all other systems would require complete removal of the gravel surface before recovering.